The Methodist Episcopal Church was chartered and registered with the Secretary of State on June 13, 1881. They shared the Baptist's church building along with the Christians and Presbyterians. 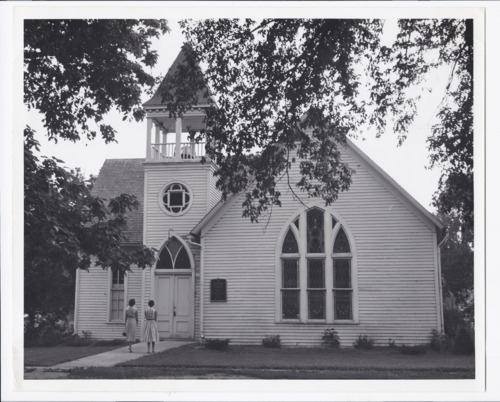 Construction of a Methodist church building began in 1884 and was dedicated on March 1, 1885. The name was changed from Methodist Episcopal to Methodist on October 11, 1939. It was changed again in 1968 to United Methodist when the United Brethren and Methodist merged. This photograph is provided through a pilot project to host unique cultural heritage materials from local libraries on Kansas Memory and was accomplished by mutual agreement between the Northeast Kansas Library System, the Rossville Community Library, and the Kansas Historical Society.